My most active collection at this time! Along with Salamence, Milotic had always been a staple of my team ever since I FINALLY caught a Feebas in Sapphire (who, by the way, is a male xD). I'm currently looking for all figures, flats, and other merchandise of my pretty sea serpent and his adorably derpy fish stage. I got this figure at Nintendo World long before I started collecting, and I'm really glad I did. So I guess you could say this is the figure that jump started my entire collection. Really nice little figures sold in Japanese vending machines back in 2004. They have the pokemon's information and footprint on its base. I like how they used their fin shapes instead, lol. Ever since it first came out in March, this figure has been eluding me. After months of searching, I finally came across one in pkmncollectors. Of course, I snatched it right up! This is a large figure, even larger than the zukan. It's so chunky! I love it! Cutest. Milotic. Ever. Stare in awe, for there will never again be a Milotic as round, chubby, and squishy as this one is. EXPLANATION TIME! So, it all started when I complained to fukamaru that all Milotic figures are in the same pose. So lo and behold, she created this magnificent sculpture for me. Such a perfect depiction of total and utter defeat! 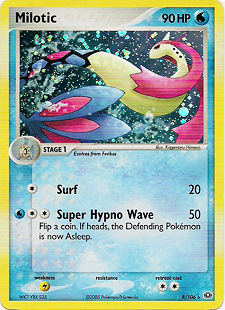 I love the art on VS Cards, so I was thrilled to find that they made cards for Feebas and Milotic. Look at them beating up various pokemon! The left card is what really made me fall in love with Feebas. He's a total BAMF. You can either see a Feebas or a Milotic depending on the angle you view it! Very cool. The sticker that came with the kids figure, along with candy. I currently have it stuck onto the wall of my shelf...with a piece of tape. A really nice sticker that was given away as part of a Pokemon Center lottery back in 2009. I, for one, am just ecstatic that they actually made new art! 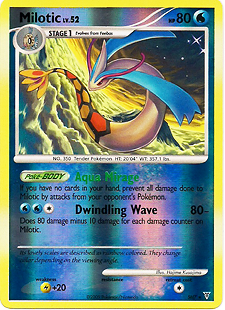 The first Milotic card ever made! Though they did forget the black markings on the tail. xD Still very pretty and shiny! Look at all the sparkles! 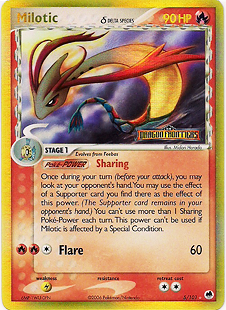 This card was featured in the Hydrobloom theme deck back in EX Emerald. Screw the laws of physics, this Milotic is on fire! The Delta Species era of the TCG features mutated Pokemon of different types than what they usually are. The lighting here looks a bit strange because rather than the background being holo, the Milotic itself is holo. The elusive shiny Milotic, in TCG form! Here it is, swimming in the...sky? Well, it is a gorgeously painted sky. Epic. All Feebas cards ever made! Not counting reverse holo versions, of course. Let's see...we have depressing!Feebas, diving!Feebas, fished!Feebas, flaming!Feebas, default!Feebas, and blank!Feebas. Hee hee...they're so adorable. Made by bladespark at pkmncollectors, of the Milotic mystery dungeon sprite. Absolutely gorgeous! Another fantastic custom, also made by bladespark! I really wanted a companion for my Milotic bead sprite. I also use this portfolio to hold my TCG collection. Hooray for practicality! Battrio Coins are used in Japanese arcade machines, in which players could use to battle others. I really like the artwork on this! There's another Milotic battrio coin I'm still looking for right now.